(Phys.org) —It's a scenario straight out of a sci-fi horror flick. Scientists take a deadly virus that people can only catch from birds and genetically engineer it so we can give it to each other. Unfortunately, the threat of such a highly contagious virus escaping the lab, whether by accident or at the hands of terrorists, could be more than fiction. To ensure that artificial bird flu strains, engineered to be transmissible between mammals, remain confined to laboratories, Benjamin tenOever and his colleagues at Icahn School of Medicine at Mount Sinai have devised a method of molecular biocontainment that prevents the expression of an influenza virus in humans and mice by altering the virus' genome so it binds to a specific microRNA. Their research appears in Nature Biotechnology. Engineering viruses to make them transmissible among mammals can help scientists learn about how viruses mutate in the wild. The study of gain-of-function mutations is an essential part of disease research. Scientists can use the knowledge obtained from such research to predict how diseases will spread and to develop new vaccines. Recently, scientists discovered that mutations could make the H5N1 and H7N9 strains of avian flu transmissible between ferrets, considered a model for humans in influenza research. Normally, birds can transmit these viruses to humans, but humans can't transmit them to each other. The mutation that allows ferret-to-ferret transition of H5N1 involves only three changes in the virus' hemagglutinin protein. The ease with which researchers might create such highly contagious mutations contributes to concerns about safety. Public authorities are worried that a mutation of the H5N1 virus could create a flu pandemic as deadly as that of 1918. To develop a way to limit the spread of the H7N9 strain to particular species, tenOever and his team turned to microRNA, strings of nucleic acid that prevent genes with particular target sequences from expressing themselves. They discovered that one microRNA, miR-192, exists in the respiratory tracts of humans and mice, but not in the respiratory tracts of ferrets. The team inserted the target sequence for miR-192 into the H7N9 genome and exposed mice and ferrets to the virus. The mice, which had miR-192 in their lungs, showed no sign of illness, even when the researchers increased the viral dose 10 times. Ferrets, which had no miR-192, contracted the virus and transmitted it normally. Mice exposed to a form of the virus with a scrambled target sequence or to a control virus died within eight days. TenOever and his team suggest that researchers use their method of containment to restrict transmission to specific species when studying highly contagious viruses, such as Ebola, SARS coronavirus and henipaviruses. Recent gain-of-function studies in influenza A virus H5N1 strains revealed that as few as three-amino-acid changes in the hemagglutinin protein confer the capacity for viral transmission between ferrets. As transmission between ferrets is considered a surrogate indicator of transmissibility between humans, these studies raised concerns about the risks of gain-of-function influenza A virus research. Here we present an approach to strengthen the biosafety of gain-of-function influenza experiments. We exploit species-specific endogenous small RNAs to restrict influenza A virus tropism. 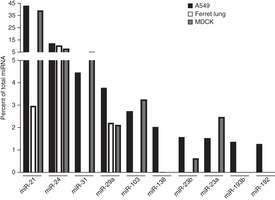 In particular, we found that the microRNA miR-192 was expressed in primary human respiratory tract epithelial cells as well as in mouse lungs but absent from the ferret respiratory tract. Incorporation of miR-192 target sites into influenza A virus did not prevent influenza replication and transmissibility in ferrets, but did attenuate influenza pathogenicity in mice. This molecular biocontainment approach should be applicable beyond influenza A virus to minimize the risk of experiments involving other pathogenic viruses. Great. Now make something that can attack MRSA, VRSA, and pneumococcus.